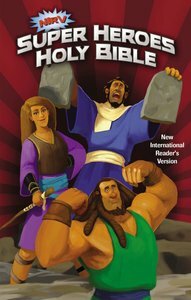 About "NIRV Super Heroes Holy Bible (Black Letter Edition)"
The NIrV Super Heroes Holy Bible takes you into an incredible world of giants and giant-slayers, kings and commanders, miracles and mysteries. Team up with the Bible's mightiest heroes as they head toward glorious victories and even some crushing defeats. As you read about their amazing adventures and truly nasty villains they faced, you'll learn the traits you need to become a hero too! More than 100 character profiles tell you the stories of Bible men, women, and children from Genesis to Revelation-including a few of the bad ones! Learn what to do, and what not to do, in order to be a hero of the faith. Have fun completing the Super Heroes Bible Quiz, packed with fun questions that will help you remember important information about your favorite heroes.